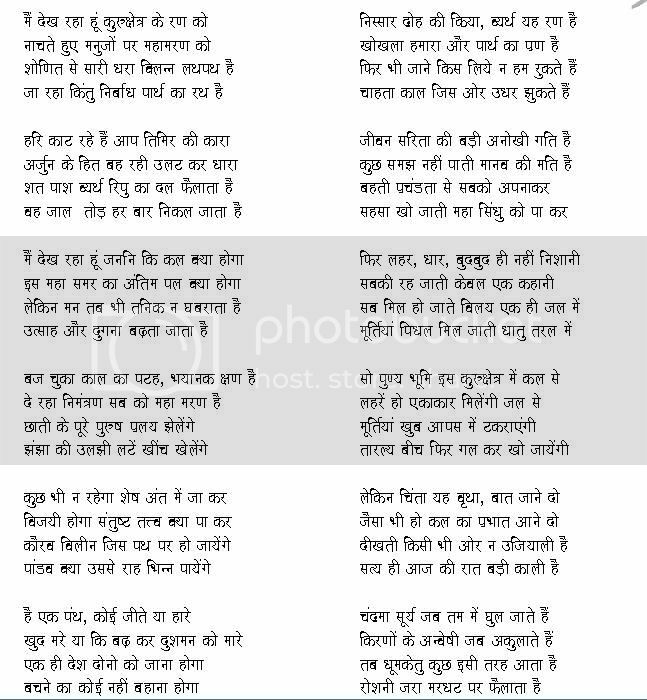 @Phoenixritu- Isn’t it a lovely poem, I have always loved the character of Karna in the epic. One of the best and most contrasting characters I have ever read in any kind of literature. Just one word, Amazing translation! Great poem and an equally amazing and great translation. Kudos to you! @Sandeep Gautam: Thanks a lot..Glad you liked it…I was afraid people might hate it. I wasnt aware of this poem but u have done a very impressive translation. Came here via Monika’s blog. Even i have joined the NaBloPoMo..
A wonderful piece of writing…loved it. @Monika: Same here, Karna is one of the most inspiring and fascinating character of the epic. wow!!! that must have required a huge effort! Kudos to u. wonderful poem. Prats, I was just reading your old posts when I came across this post. What a brilliant brilliant effort at translation. I know Japanese and have often translated Japanese literature into English – So I know how tough it is to get the nuances right, especially in poetry.